Yahoo – it’s the first day of summer and there’s no reason why everyone, including city dwellers cannot display and grow this smorgasbord of aromatics. 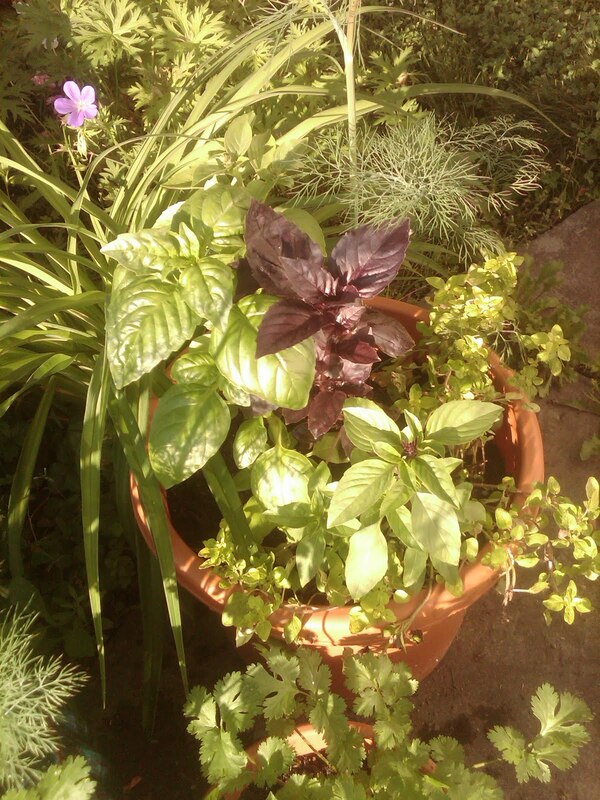 For your culinary use, squeezed into one clay pot is a menagerie of herbs: Purple Basil, Thai Basil, Sweet Basil, Lemon Basil, Cilantro, Dill and Golden Marjoram. So make growing a kitchen garden doable no matter your location. These colorful and tasty herbs make salads, marinades, main dishes all glimmer with freshness. Sarah Ban Breathnach wraps up this first day of summer blog with her endearing insight about the month of June. “This month we rediscover that it is life’s enrichments rather than the riches of life that bring us true contentment.” So clip and snip from your kitchen garden, even if it lives in a tiny pot.